Barricading is the effective screening of a magazine containing explosive materials from another magazine, a building, a railway, or a highway, either by a natural barricade or by an artificial barricade. 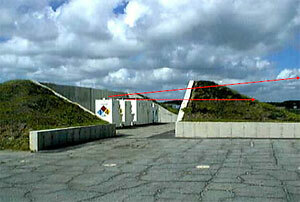 When evaluating whether a magazine is properly barricaded to a highway, determine whether a straight line, from the top of any side wall of the magazine to a point 12 feet above the center of a highway, will pass through the barricade. ATF does not consider earth covering a magazine as a barricade. A barricade must be separate from a magazine. Natural barricades are features of the ground, such as hills or timber of sufficient density that the surrounding exposures that require protection cannot be seen from the magazine when the trees are bare of leaves. Artificial barricades are an artificial mound or revetted wall of earth of a minimum thickness of 3 feet, or any other approved barricade that offers equivalent protection. ATF does not consider earth covering a magazine as a barricade. A barricade must be separate from a magazine. 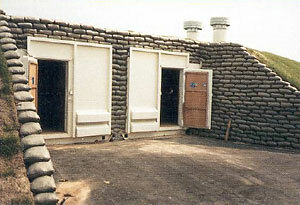 Federal regulations require that Type-1 and Type-2 explosives magazines be bullet-resistant. The term "bullet-resistant" means resistant to penetration by a bullet of 150 grain M2 ball ammunition having a nominal muzzle velocity of 2,700 feet per second fired from a .30 caliber rifle from a distance of 100 feet perpendicular to the wall or door. The construction requirements for Type-2 outdoor magazines, i.e., exterior and doors constructed of not less than ¼-inch thick steel and lined with at least 2 inches of hardwood, were established to ensure bullet-resistance. ATF Ruling 76-18 specifies alternate bullet-resistant construction standards for explosives magazines. Part 555.208(b) addresses Type-2 indoor magazines that, due to the additional protection against bullet penetration normally afforded by the associated building, have less stringent construction requirements. Type-2 indoor magazines need not be bullet-resistant if the buildings in which they are stored provide protection from bullet penetration. However, if neither the magazine, nor the building in which it is located, is itself bullet resistant, then the combination of the magazine and the building must meet bullet-resistance requirements. If there is a concern that the combined construction of a particular Type-2 indoor magazine and its associated building does not meet bullet-resistance requirements, and ATF Ruling 76-18 does not address the situation, a licensee or permittee may submit a request for a variance to the bullet-resistance requirements contained in 555.208. Variance requests should be submitted to the Explosives Industry Programs Branch through the local ATF office. If you choose to submit a request for a variance, please include specific construction information for both the magazine and the building in which it is located, in your request.